When using pgadmin, the execution time at status bar is including data transfer time, unfortunately, I am using pgadmin status bar execution time to compare with MySQL server execution time which is unfair. I will update the correct benchmark soon. 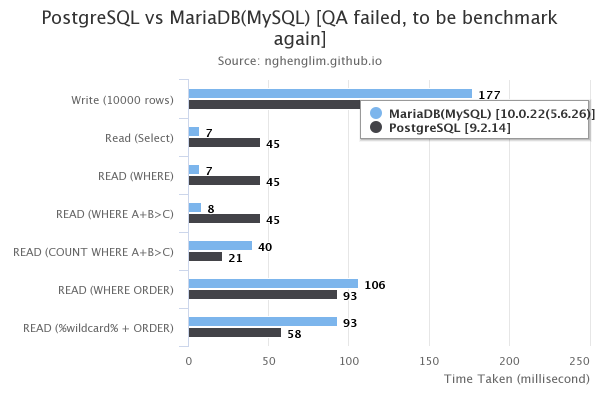 MariaDB(MySQL) is good at dead simple query, however PostgreSQL is good at more complicated query. For real world scenario, it will more likely has a lot of complicated query, therefore its better to choose PostgreSQL for it - provided that PostgreSQL comes with lots of useful feature that MySQL lack of.